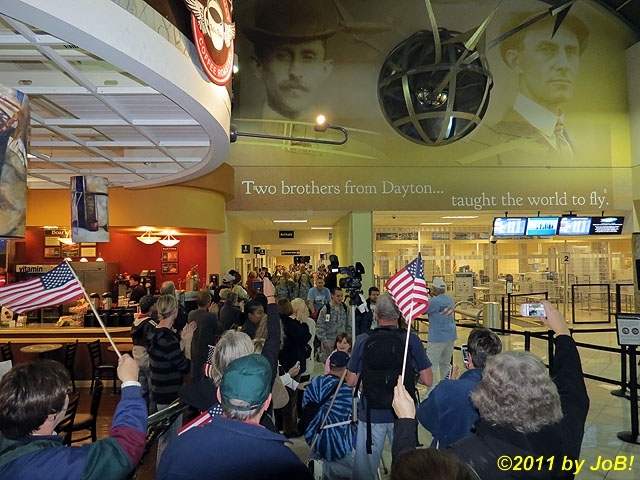 Last Saturday evening, one area of Dayton was intentionally turned back to a bygone era to help say ‘thank you’ to several dozen men and women who did not get this kind of adulation at the conclusion of their military service decades earlier. 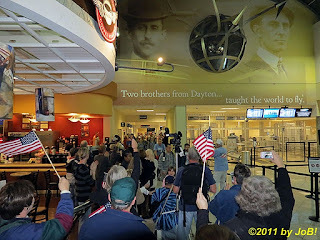 A crowd of about 200 gathered at the Dayton International Airport to provide a heartfelt salute to 34 World War II and Korean War veterans upon their return from a day-long ‘Honor Flight’ excursion to the nation’s capital. Friends, family members and even complete strangers participated in this patriotic ‘Welcome Home’ ceremony in the airport’s main terminal, which came as a complete surprise to many the unsuspecting travelers. 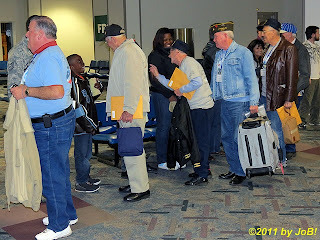 Honor Flight Dayton, a regional element of the national Honor Flight program, solicits names of veterans from the World War II, the Korean War and Vietnam War eras. 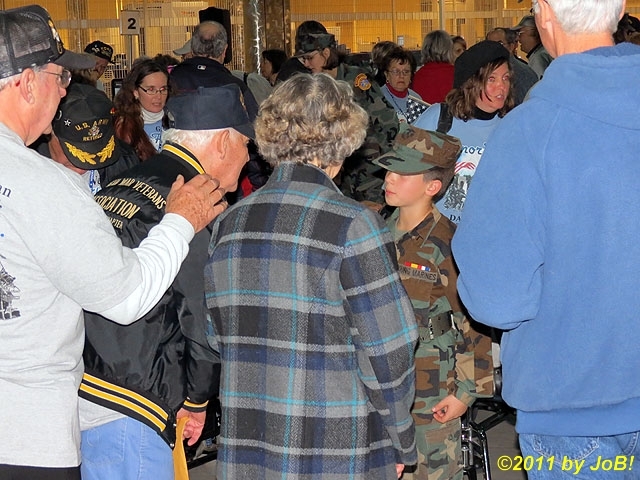 Jim Salamon, director of the Dayton organization, was originally introduced to this program through the non-stop praise shared by his father-in-law, a World War II veteran, after he made his trip on Veterans Day 2006. 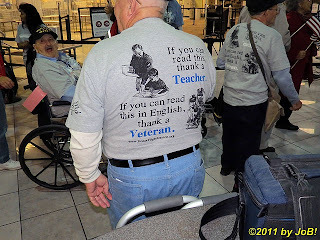 He was so impressed by his response that he decided to serve as a ‘guardian’, a volunteer member who flies with the veterans to provide assistance and companionship during the day, on three separate flights the following year. Although he did not wear his nation’s uniform, Salamon felt compelled to donate his time to this worthy cause and assumed his current director position in 2008. 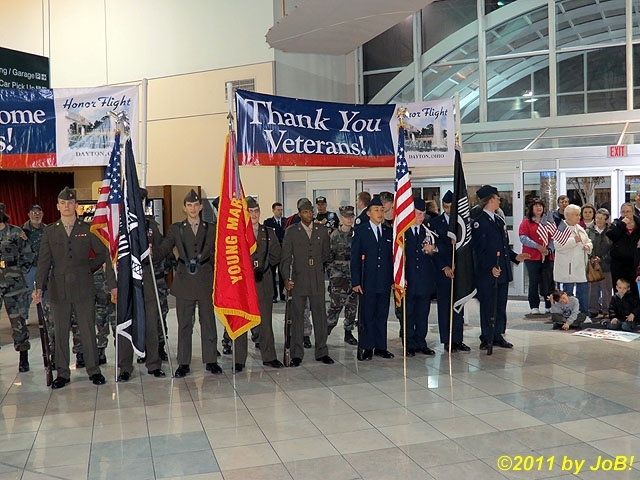 During his tenure, he solicited donations from numerous corporate and private sponsors that have funded 51 local flights for several hundred veterans to experience their once-in-a-lifetime events. Eight flights were taken during 2011 and another eight are scheduled for next year, beginning in April. One key tenet of the Honor Flight program is veterans do not pay for their travel. 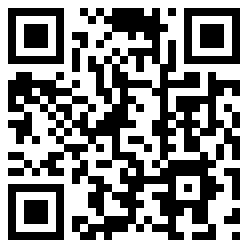 Once submitted applications are reviewed and approved, these chosen men and women are provided free round-trip transportation to Baltimore, Maryland on a commercial aircraft as well as complimentary coach service to and around Washington, DC. While there, the honorees visit national sites venerating their service as well as the service of those who made the ultimate sacrifice in defense of their nation. The National World War II Memorial, the Korean War Veterans Memorial, the Vietnam Veterans Memorial, the US Marine Corps Iwo Jima Memorial and Arlington National Cemetery are the primary stops on a day that many of the participants will remember for the rest of their lives. The current flight schedules have Honor Flight participants leaving Dayton very early in the morning and returning on the partner airline’s last scheduled arrival—an nearly 19 hour day for individuals in their 70s, 80s, or even 90s. 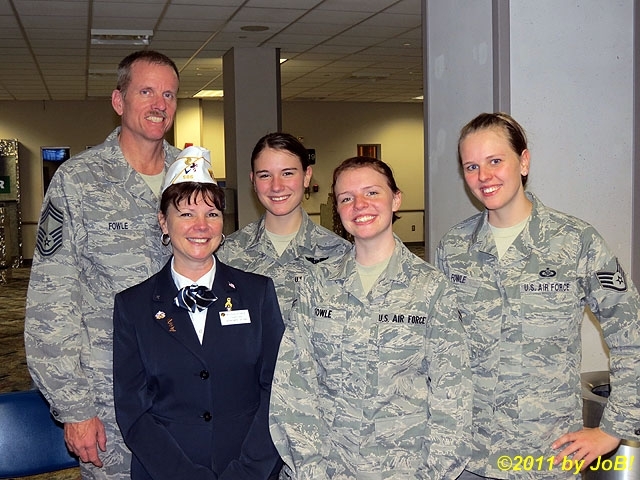 Upon the plane’s arrival in Dayton, a contingent of current and retired Air Force and family members from the Wright Patterson Air Force Base community greeted the honorees who thanked each of them for their service. 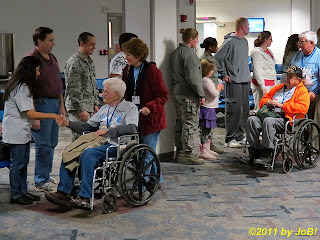 After congregating at a staging area just outside the walkway to the airport’s baggage claim area, the veterans were allowed to make their way out to the awaiting crowd whose loud cheering and physical exuberance at such a late hour put a spring in the steps of these travel weary men and women and their aides. The dynamic notes of Big Band music filled the air and helped provide the proper atmosphere for this postponed celebration. Off to the side, an honor guard--composed of uniformed Air Force Junior ROTC cadets as well as members of the Miami Valley chapter of the Young Marines—stood at rigid attention and presented the colors during the playing of the National Anthem and the reciting of the Pledge of Allegiance. After some short comments by Salamon, the welcomes and appreciation continued until the crowd began dispersing as the clock closed in on midnight. 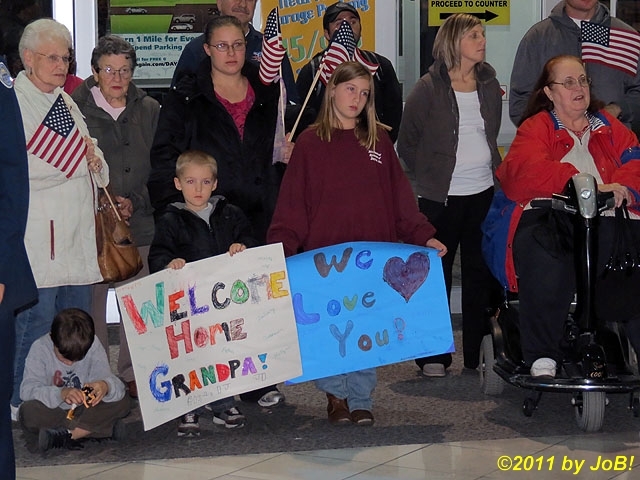 One of the goals of the Honor Flight program is to provide closure to men and women who have held on to personal emotions and issues since returning from war. During his comments, Salimon provided one example of a veteran who, after 65 years, was finally able to share his personal feelings about his wartime service with his wife. Over those many years, guilt haunted him and prevented him from enjoying his life when many of his fellow soldiers lost theirs. Through his trip, he was finally able to ‘forgive’ himself for his good fortunes and put those negative feelings to rest. Due to the distances and time involved in transporting troops during that conflict, many returning World War II veterans did not have the opportunity to participate in the mass celebrations that spontaneously erupted across the country at the conclusion of the war. One of these events occurred in New York City’s Time Square and was captured in Alfred Eisenstaedt’s iconic V-J Day photograph of a sailor kissing a nurse. 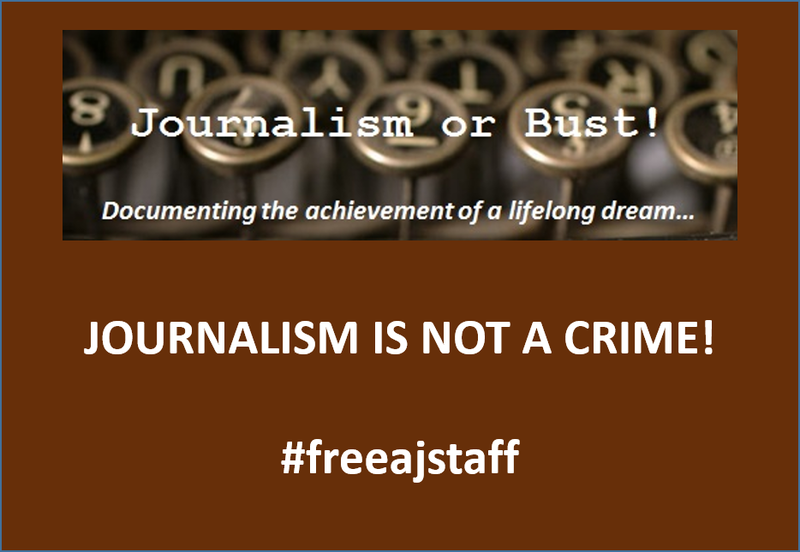 Arriving stateside several weeks or months later, they quietly slipped back into their interrupted lives or started brand new chapters without experiencing any tangible recognition for their efforts. With the number of remaining World War II and Korean War veterans steadily decreasing, the challenge to Salamon and to others in the Honor Flight program is to help as many of them to resolve and achieve closure with their past periods of military service. Fortunately, for these 34 men and women, their ‘Times Square’ moments finally happened. On Film: "The Year of Living Dangerously"